I'm back with another installment of Nails Talk! Pretty excited about this post because I'm going to be sharing with you guys one of my favorite polish brands, Megan Miller. Here's a little about Megan Miller as extracted from their website. The Megan Miller Collection is a collection of fine nail polish. It started as a vision of a rustic, natural elegance which utilizes the finest materials to provide that experience. The idea grew from the style and design infused into the product by our founder Megan. We’ve set out to develop a line which empowers and inspires confidence to ‘Be Colorful’, look good, feel good and be at your best! What I love about Megan Miller polishes is that they are environmentally friendly, they are B3 free polishes, the great formula and their unique packaging. Megan Miller's logo is that of a feather inspired by the display that a peacock potrays when its feathers are in full bloom. What's more unique is that every bottle comes with a cork top! Some people have mentioned that the cork top makes it hard to handle but I beg to differ. I actually find it pretty easy to handle. Each bottle also comes with a raffia string tied to it giving it a unique feel and look. Spot it in the photo below. Anyway, I decided to create another set of nail art with two of the Megan Miller polishes that I got. Painted 2 coats of China Glaze Faith and 1 coat China Glaze Luxe and Lush to set the base. Decided to use Luxe and Lush so as to give the design a different texture. After that, I painted what I love most - color blocks - with Caribbean and Coral Bliss. Finished with a coat of top coat and then it was good to go. Initially, I had my doubts about pairing Caribbean and Coral Bliss together but after seeing the design, I have to say I actually love this color combination! Since this post is about Megan Miller polishes, how can I not show the swatches of the 2 colors in their fullest glory right? First up, we have Coral Bliss. 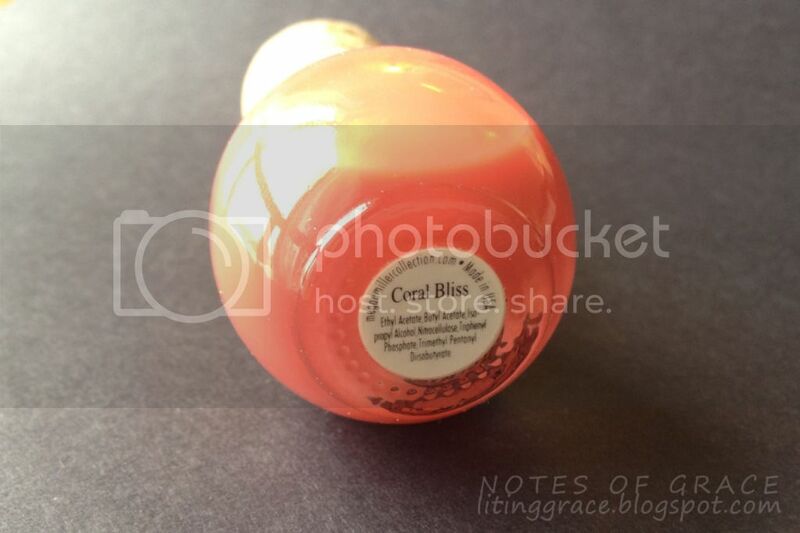 Coral Bliss, a color from the Megan Miller Summer 2012 collection is a gorgeous coral sheer jelly polish. The color is a warm coral red, leaning closer to red than pink. Application was a breeze and it's really glossy even after it dries. The above swatch shows 4 coats (3 thin coats and 1 thick coat) and without any top coat. I have never been a fan of coral because coral orange doesn't look great for my skin tone but Coral Bliss is a gorgeous coral red which I have fallen in love with. 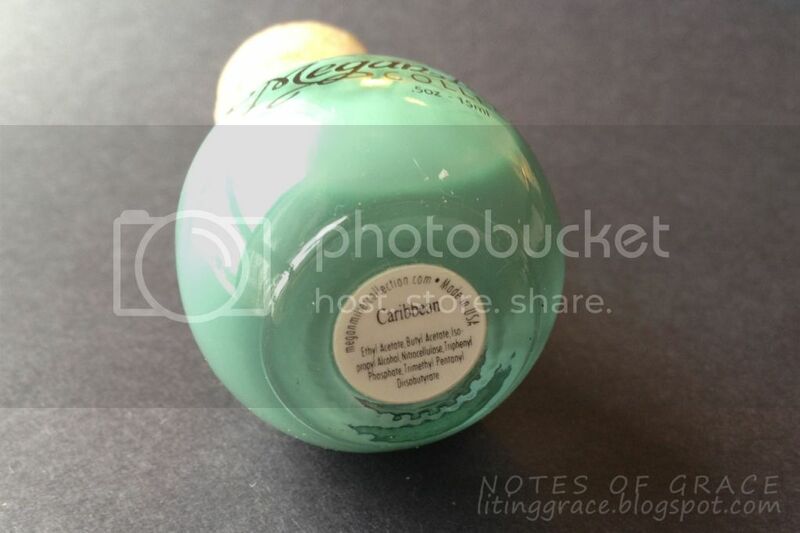 Caribbean is a blue/green and like Coral Bliss, it's a sheer jelly polish. Painted 4 coats (3 thin layers and 1 thick layer) just like Coral Bliss. There was a bit of visible nail line but somehow it's more visible in photos than in real life. Megan Miller polishes are available at Mei Mei Signatures. Mei Mei is another local online store that stocks various brands such as Nfu Oh, Nubar, OPI, China Glaze, Color Club, Estessimo TiNS, Barielle, Best Nail Treatments, Blaze, Real Gold Inc., Glitter Gal, Girly Bits, Cult Nails, A-England, LCN, Hopscotch Kids, Oops! J, Cuccio Naturale, SueSa and Cracking Topcoat (house brand). Not only that, Mei Mei is also the exclusive stockists for popular indie brands such as All That Glitters, Cirque, GlitterDaze, Sparkles By Julie and Daring Digits. 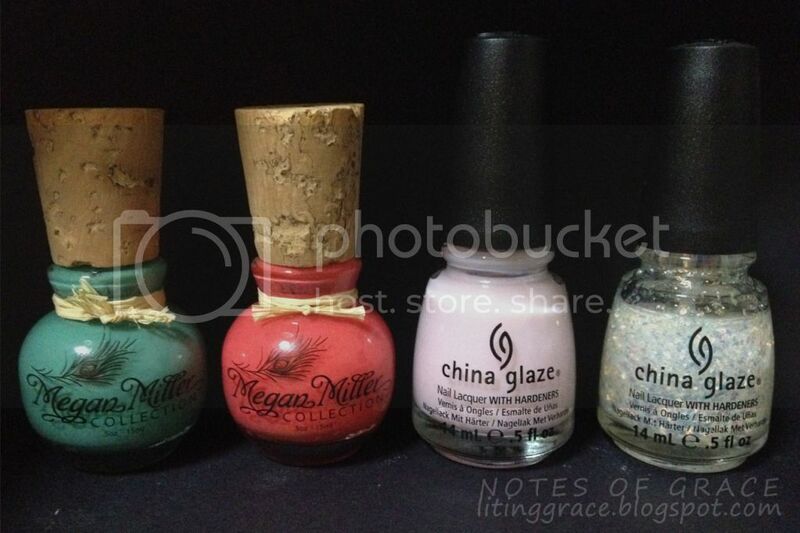 If you are interested in getting the above Megan Miller polishes, hop on to Mei Mei now! They are having a one for one promotion for Megan Miller polishes till Monday, 20 August 2012. 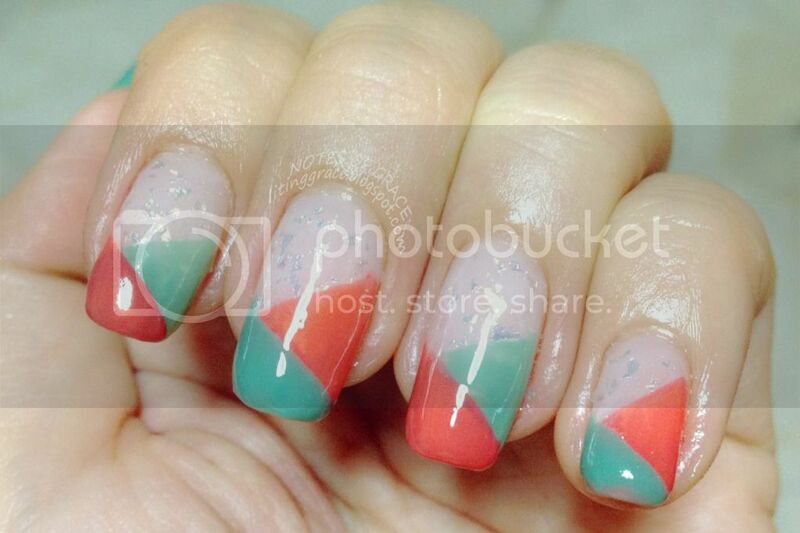 For the price of S$18.00 you get 2 bottles of awesome polishes which is really worth it! Coral Bliss is currently out of stock but Caribbean is still available. What's more Mei Mei is a super lovely lady! I have been purchasing from her since April and her service is superb. Prompt and she ships out polishes real fast! Usually I will receive my polishes within 2 to 3 days after payment is made. All right, that's all for today. I will be back soon with another installment of Nails Talks plus updates on Project 365 which I have not been updating for a while. Till then, enjoy the public holiday and have fun!